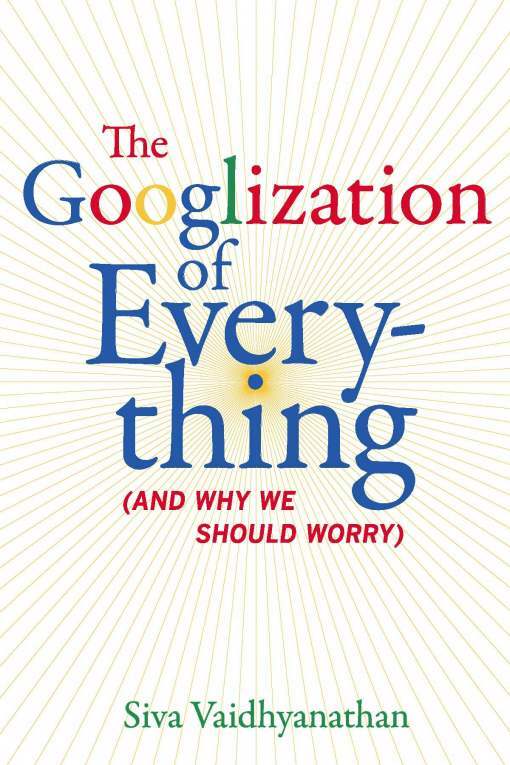 In one sense, Siva Vaidhyanathan’s new book, The Googlization of Everything (And Why Should Worry), is exactly what you would expect: an anti-Google screed that predicts a veritable techno-apocalypse will befall us unless we do something to deal with this company that supposedly “rules like Caesar.” (p. xi) Employing the requisite amount of panic-inducing Chicken Little rhetoric apparently required to sell books these days, Vaidhyanathan tells us that “the stakes could not be higher,” (p. 7) because the “corporate lockdown of culture and technology” (p. xii) is imminent. After lambasting the company in a breathless fury over the opening 15 pages of the book, Vaidhyanathan assures us that “nothing about this means that Google’s rule is as brutal and dictatorial as Caesar’s. Nor does it mean that we should plot an assassination,” he says. Well, that’s a relief! Yet, he continues on to argue that Google is sufficiently dangerous that “we should influence—even regulate—search systems actively and intentionally, and thus take responsibility for how the Web delivers knowledge.” (p. xii) Why should we do that? Basically, Google is just too damn good at what it does. The company has the audacity to give consumers exactly what they want! “Faith in Google is dangerous because it increases our appetite for goods, services, information, amusement, distraction, and efficiency.” (p. 55) That is problematic, Vaidhyanathan says, because “providing immediate gratification draped in a cloak of corporate benevolence is bad faith.” (p. 55) But this begs the question: What limiting principle should be put in place to curb our appetites, and who or what should enforce it? Vaidhyanathan doesn’t really connect the dots to tell us how Google or any of the other evil capitalist overlords have supposedly conspired to take away such “real control” over the conditions of our lives. Instead, he just implies that any “choice” they offer us are “false,” “empty,” or “irrelevant” choices and that he and other elites can help us see through the web of lies (excuse the pun) and chart a better course. How utterly condescending. Sadly, such elitist “people-are-sheep” thinking is all too common in many recent books about the Internet’s impact on society. See my reviews of recent books by Andrew Keen, Mark Helprin, Lee Siegel and even to some extent Jaron Lanier. For more discussion and a critique of this thinking, see my recent book chapter, “The Case for Internet Optimism, Part 1: Saving the Net from Its Detractors.” Simply stated, these critics simply don’t give humanity enough credit and they utterly fail to recognize how humans excel at adapting to change. But should there have been an “election to determine the Web’s rulers”? And who is this “other authority” that should have “stepped into the void” and made the Web more “stable, usable, and trustworthy”? Like so many other would-be cyber-planners, Vaidhyanathan never details what better plan could have saved us from the supposedly tyranny of the marketplace. We’re simply told that someone or something could have done it better. Web search could have been better. Digitized book archiving could have been done better. Online news could have been done better. And so on. Because Google has touched each of these areas, Vaidhyanathan makes the company his scapegoat for all that is supposedly wrong in the modern digital world. But the “Googlization” of which he speaks transcends one company and refers more generally to any and all private, market-based responses to the challenges of the Information Age. Again, it is the fact that such market processes are so messy and uneven that has Vaidhyanathan so incensed. How could we — and his royal we inevitably refers to the political or academic elites who supposedly should have been looking out for us — have allowed this process to unfold without a more sensible plan? From these statements we can obviously deduce that Vaidhyanathan doesn’t much believe in the power of markets, but it’s equally clear he doesn’t really seem to understand them. Markets are simply learning and discovery processes. They are ongoing experiments. And experiments can be messy. They can be turbulent. They can be uneven. But the process of experimentation and discovery has valuable benefits that cannot be centrally planned or divined by a technocratic elite preemptively. Vaidhyanathan doesn’t like that fact very much. He is a believer in the proverbial “better path” or One True Way. Yet, when Vaidhyanathan says “it’s more important to do it right,” the operational assumption is that we already know what “it” is and how to do it “right.” And when he suggests “it’s more important to have knowledge sources that will work one hundred years from now,” it suggest that somewhere out there a more enlightened path exists and that he and some other elites in the Human Knowledge Project apparently possess a map to guide us to it. This is the height of hubris. There is no way in hell any of us could know which “knowledge sources” will work one hundred years from now or even 10 years from now, for that matter. That is precisely where markets come in. Organic, bottom-up, unplanned experimentation is valuable precisely because of the limitations of human knowledge and planning. Wikipedia, for example, isn’t the product a highly planned, centralized vision set forth by some massive information bureaucracy. I doubt a “Human Knowledge Project” could have designed such a thing from scratch 10 years ago. Instead, they would have likely started with Encyclopedia Britannica and Encarta as models and then spent billions trying to figure out how to make them better. Worse yet, Vaidhyanathan treats technological progress as a zero-sum game. He says, for example, that “it’s more important to link poor children in underdeveloped regions with knowledge than to quicken the pace of access for those of us who already live among more information than we could possibly use.” (p. 204) Substitute the word “money” for “knowledge/information” in the above passage and you’ll discover the typical zero-sum thinking behind much global development thinking today. The traditional reasoning: Some of us are lucky enough to have money or resources and that means we must be depriving others of them. That’s faulty logic, of course. Simply because one region or economy prospers it does not mean others must suffer. The same goes for information policy. We can do more to aid the poor and unconnected in underdeveloped regions without depriving information-rich countries and peoples the benefits of more and better services. After all, who is Vaidhyanathan to say that we already have “more information than we could possibly use”? Is there a meter running on how much information is too much for us? Needless to say, there isn’t much that this veritable Ministry of Information wouldn’t be considering or planning. Vaidhyanathan repeats, however, that it would constitute “public failure” if we failed to institute such a plan for the future. Of course, there’s another definition of “public failure” that Vaidhyanathan never bothers considering. It’s the “public failure” identified by public choice economists and political scientists who have meticulously documented the myriad ways in which politics and political processes fail to achieve the idealistic “public interest” goals of set forth by Ivory Tower elites. For example, Vaidhyanathan never bothers considering how expanded the horizons of state power in the ways he wishes might become an open invitation for even more of the corporate shenanigans he despises. After all, history teaches us that regulatory capture is all too real. But Vaidhyanathan doesn’t have much time for such meddlesome details. He’s too busy trying to save the world. Vaidhyanathan is a near perfect exponent of what political scientist Thomas Sowell once labeled “the unconstrained vision.” A long line of thinkers—Plato, Rousseau, Voltaire, Robert Owen, John Kenneth Galbraith, John Dewey, John Rawls—have argued that man is inherently unconstrained and that society is perfectible; it’s just a matter of trying hard enough. In this vision, passion for, and pursuit of, noble ideals trumps all. Human reason has boundless potential. Unsurprisingly, therefore, this crowd believes that order and justice derives from smart planning, often from the top-down. Elites are expected to make smart social and economic interventions to serve some amorphous “public interest.” Smart solutions and good intentions matter most and there’s little concern about costs or unintended consequences of political action. Finally, desired outcomes are pre-scripted and distributive or “patterned” justice is key. Because markets cannot ensure the precise results they desire, they must be superseded by centralized planning and patterned, equal outcomes. Of course, back in the real world, the rank hubris of the unconstrained mindset conflicts violently with economic and cultural realities at every juncture. As Friedrich von Hayek taught us long ago, “To act on the belief that we possess the knowledge and the power which enable us to shape the processes of society entirely to our liking, knowledge which in fact we do not possess, is likely to make us do much harm.” It’s a lesson that many countries and cultures have learned at great expense, but one that utopians like Vaidhyanathan still ignore. This insidious, short-sighted, overly pessimistic worldview is contradicted at almost every juncture today by the fact that—at least technologically speaking—things are getting better all the time. There’s never been a period in human history when we’ve had access to more technology, more information, more services, more of just about everything. While we humans have wallowed in information poverty for the vast majority of our existence, we now live in a world of unprecedented information abundance and cultural richness. Critics like Siva Vaidhyanathan will, no doubt, persist in their claims that there is “a better path,” but the path we’re on right now isn’t looking so bad and does not require the radical prescriptions he and others call for. Moreover, the alternative vision doesn’t begin with the insulting presumption that humans are basically just mindless sheep who can’t look out for themselves.